Researcher finds his funding halted-links vaccines to autism..Duke Univ. commits research fraud-funding not halted. The following is a personal response from Dr. Dale regarding the recent article posted by The Times (United Kingdom) regarding a controversial British academic who claims childhood vaccines can cause autism and has been blocked from raising research funds after protests by other scientists. Professor Chris Exley, of Keele University, infuriated health experts by telling parents the aluminium in vaccines given to babies to protect them from diseases such as whooping cough, and in the human papillomavirus vaccine given to teenagers, may cause “severe and disabling” autism. 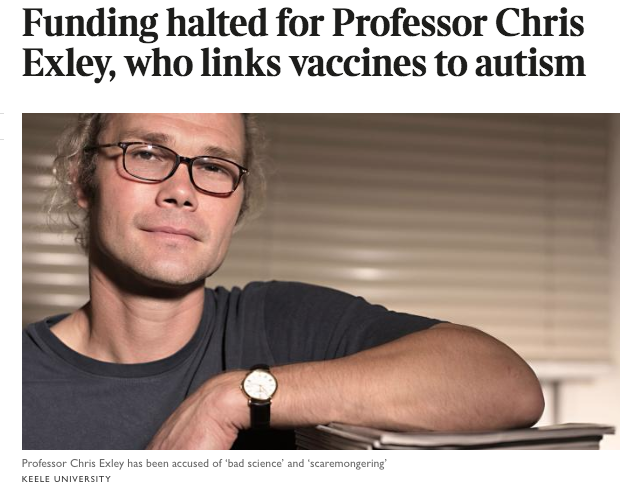 It echoes the “anti-vax” controversy surrounding Andrew Wakefield, whose 1998 claim that the MMR (measles, mumps, and rubella) vaccine caused autism led to a fall in immunization rates. Dr. Dale: This actually lead to a pretty unique situation where research, published in a peer-reviewed journal, notes that “During the same time period, the average autism spectrum disorder prevalence in the United Kingdom, Norway, and Sweden dropped substantially after the birth year 1998 and gradually increased again after the birth year 2000.” Thus, giving substantial scientific evidence of a causal association between the MMR vaccine and autism.